A giant crab and a giant gator are among the more than 30 balloons set to take flight during The Ohio Challenge Balloon Festival and Team Fastrax Warrior Weekend to Remember. The annual event will return to Middletown’s Smith Park/Middletown Regional Airport this weekend. “This is a good, positive event for the city. Everyone loves to see the balloons. There’s always that ‘Wow’ factor. Spectators often wonder ‘How did they get up there?’ ‘How do they stay up there?’ and they follow them. It’s so cool,” said Kathy Stites, event manager, The Ohio Challenge. 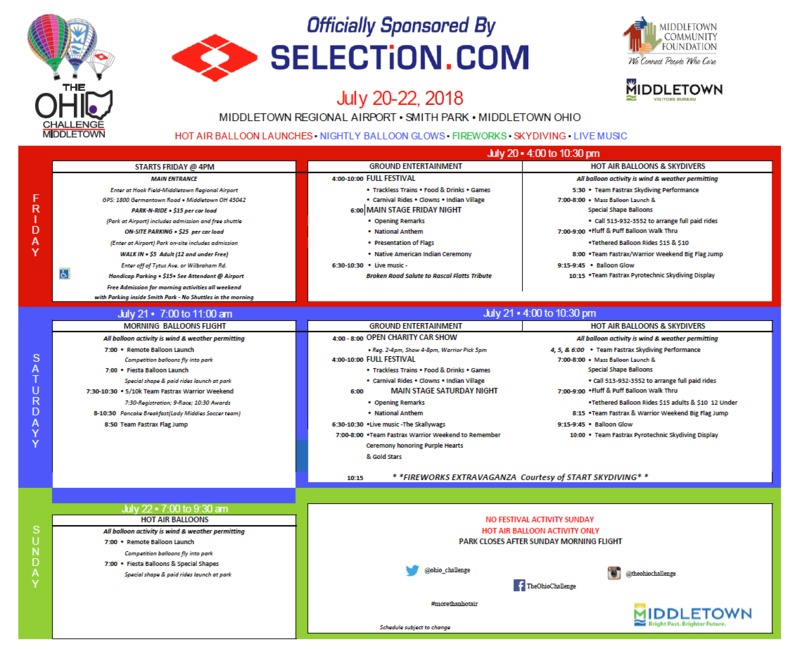 Presented by Selection.com, the event runs Friday, July 20, and Saturday, July 21, from 4 p.m. to 10:30 p.m. The festival includes balloon competitions and balloon glows, fireworks, skydiving demonstrations, a laser light show, tethered balloon rides and live entertainment. There will also be carnival rides for children from Murray Brothers Amusements, Inc., expanded food booth offerings, as well as 25 arts and crafts vendors on site. This is the 16th year for the festival, which has grown into one of the area’s largest, signature summer events. More than 300 volunteers come together to support the festivities. Check out launches of colorful balloons of all shapes and sizes. Mass balloon launches and special shapes will take to the skies on Friday and Saturday from 7 p.m. to 8 p.m. Beyond the visual spectacle of bright colorful balloons in the sky, The Ohio Challenge is a sanctioned hot air balloon competition. This year over 30 participants will compete for the Ohio Challenge Trophy and to qualify for a national tournament. Experience the fun yourself with tethered hot air balloon rides for $10 and $15 or try out the Fluff & Puff balloon walk-through as well. Call 513-932-3552 to arrange full paid rides. All balloon activity is wind and weather permitting. Admission to the park is free during morning hours for those who would like to see the Saturday and Sunday morning balloon flights. Balloons can look even more amazing at night. This year’s balloon glows will take place Friday and Saturday from 9:15 p.m. to 9:45 p.m.
A fireworks display sponsored by Start Skydiving will start around 10:15 p.m. Saturday. Team Fastrax skydiving performances will take place at 5:30 p.m., 8 p.m. and 10:15 p.m. Friday and again at 4 p.m., 5 p.m., 6 p.m., 8:15 p.m. and 10 p.m. Saturday. Beyond the balloons, you’ll find plenty of family fun all weekend long. The event will include outdoor concerts, arts and crafts, festival foods and carnival rides. “There’s so much to do. There’s a little something for everybody. It’s a good family-oriented festival in the park. There’s a lot of good food, and a lot of great vendors. It’s a good place to be,” said Sean Askren, a Middletown resident, pilot committee member and FAA liaison. There will be live music on Friday night with Broken Road, a Rascal Flatts tribute band and on Saturday evening featuring The Skallywags from 6:30 p.m. to 10:30 p.m.
Main Stage activities, including opening remarks and the National Anthem, will begin at 6 p.m. on Friday and Saturday. A Wounded Warrior Honoring Ceremony, recognizing Purple Hearts and Gold Stars, will be held on Saturday from 7 to 8 p.m.
For a complete list of events and activities, visit the Ohio Challenge website. The show featuring 125 to 150 cars will be held on Saturday from 4 p.m. to 8 p.m. Registration for the car show is 2 p.m. to 4 p.m. Cost to register is $15. Dash Plaques are guaranteed to the first 100. A number of awards will be given. Watch hot air balloons before enjoying a hearty breakfast of pancakes, sausage, fruit, coffee and juice from 8-10:30 a.m. Saturday. The breakfast supports the Middletown High School girls soccer team. The cost is a suggested donation of $5. WHEN: Friday, July 20 and Saturday, July 21. The festival is open 4-10:30 p.m. Friday and 7 to 11 a.m. Saturday and again from 4-10:30 p.m. Saturday. Balloon activity only from 7-9:30 a.m. Sunday. ADMISSION: During regular evening festival hours, walk-in admission is $5 per adult (children ages 12 and under are free), $15 per car load (which includes a free shuttle ride and admission for all in the vehicle). Vehicles should enter the festival grounds via Middletown Regional Airport, 1800 Germantown Road.